Readers — A bunch of you have been sending this fantastic story from New Zealand, where a school abandoned its plans to build a fancy, new playground because there were just too many regulations and expenses. Instead, it decided to let kids play the old-fashioned way, by making their own fun. Mudslides, skateboarding, bullrush [which sounds like Kiwi Red Rover] and tree climbing kept the children so occupied the school no longer needed a timeout area or as many teachers on patrol. What do kids need to feel excited and engaged? Haha… I just came on to your site to get your email address so I could send you this article… good thing I read your latest post first… someone beat me to it! Yay for common sense winning! HA! I just posted this to your FB page this afternoon. Although it speaks directly to the experiences of a school in Auckland, I have noticed that many of the schools in NZ subscribe to this common sense approach. I am a Canadian living in NZ and the school that my children attend at the top of the South Island is just like this. The kids just PLAY. It’s amazing. No cotton wool, just common sense. And it doesn’t happen while playing Minecraft, either. Love this – just wish our school had big enough trees to climb! It’s our Yank name for “British Bulldogs” 🙂 At least, those of us who are old enough to remember the pre-cotton-wool days. I doubt most kids today would have any idea what it is. As for the rest of the story, what’s Kiwi for “well, duhhh!”? We go to a local park with playgound etc. but mine run off to the back 40 area to play “camp” “house” among the rocks and trees… love it! Like Michelle there is a couple playgrounds around here we visit that have woods next to it and the kids often try to go over to the woods and play instead of on the playground. Kids like to get in the woods and nature and explore. I think it is in their blood. I always loved doing it too. All that and Middle Earth to boot…hurrah. Moss grew on the “enrichment centers,” even on the metal bars, and they were removed some years later. Absolutely fantastic. No WAY this would happen an ANY school in America. Kids seem pretty much the same everywhere: I recently read an inquiry of 600 kids of 6 to 12 years old, and they too said their favorite place to play outside was ‘nature/forest’. As with any game involving physical contact between players, there are those who maintain that its inherent risks, however unlikely, must be weighed against the pastime’s potential to generate personal enjoyment. For example, when the runner breaks through a link (or attempts to break through), it is worried that the action can hurt the linkers’ arms or body or knock these individuals to the ground. Particularly discouraged practices include: linking players hand-to-wrist or hand-to-arm (players should hold hands only), “clotheslining” an opposing player at throat height, or extending the hands so an onrushing player runs into a fist. Some good news. Thanks to the certain New Zealand schools for allowing a saner world. Here are my two thumbs up… Waaaayyyy UP! Give that principal an even brighter spotlight. .. and if you keep score of the game on paper, you could get paper cuts. Don’t forget that. (Rolls eyes). They will only accept this if I have a link to a scholarly-sounding source document. 😉 Anyone care to help me out? Adults ruin free play for kids by over thinking possible risks. Left on their own, kids manage themselves better and can solve their own problems. Come to think of it, maybe sideswiping someone else in the neck is safer…. :-). Shame we don’t have rotary clotheslines at schools too. the playground where I did grades 3-5, in the 1950s, the playground bordered, without any fencing, on a swamp. Funerals for drowned students were remarkably infrequent. I was struck by the professor’s comment about the development of the frontal lobe. I don’t know the science behind it, but if he’s right that frontal lobe maturity can be hindered by lack of risk-taking opportunities, then I have to wonder how that impacts recent reports about the age at which the frontal lobe is fully developed. I’ve heard mid-20’s, but is that fairly inflexible, like the age at which children get and loose teeth, or is it partly a function of the environment, like physical maturity? That would be very interesting to know. We know good nutrition is leading to earlier physical maturity. If our “cotton-wooling” behavior is simultaneously causing delayed brain maturity, that seems like a recipe for a lot of problems. Can’t wait to see more research on this subject! Hee hee. The “bullrush” sequence at my Kiwi primary school (40 years ago) went like this. Everyone plays bullrush. After x weeks/months, someone breaks an arm (yay! a cast to write on!). Bullrush banned. After x days/weeks, everyone playing bullrush again. AND repeat…. Amen. I always found, as an early childhood teacher, that the worst behaved kids were on the tightest leashes. 53 years ago our small Wisconsin town offered “Park School” to children during the summer. It was was held in the city park and consisted of pre-school and early elementary school kids. We would play games and the park school teacher would tell stories and we’d color in coloring books. Well, Red-Rover was one of the games and I remember getting knocked flat on the ground when I was 5-years-old by a big 10-year-old girl. Yes, I cried and my nose bled but the park school teacher just helped me up and gave me a little first aid. I then rejoined the other kids and resumed the game. Just because a little kid gets knocked down and hurt and even bloodys his nose a bit does not mean he’ll be scarred or disfigured for life! In fact, it will make the child tougher. But nowadays, as soon as a young child gets a little scratch, everybody goes into a tizzy and then the “dangerous” activity is banned. Typical 21st century American OVERreaction when it comes to kids! 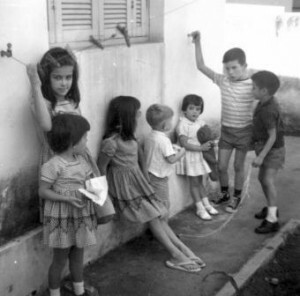 The game of Red-Rover actually strengthened childrens’ hands and grips back then. But heaven forbid, nowadays we don’t want children to get too strong physically otherwise they might turn into bullies! LOVE that article, thank you for sharing. I especially enjoyed the part about climbing trees and adults having conversations with them from the ground, perfectly calm. This sounds like me trying to get my kids don for dinner and my neigbors looking at me like I’m out of my mind. It’s just a tree! I do also agree with the food discussion about meals and delayed gratification vs. the American model of constant grazing and snacking. I do think more kids would make healthy food choices (if offered) when they are genuinely hungry for a meal. And no kids meals! Never thought about this…what a concept. For example, when the runner breaks through a link (or attempts to break through), it is worried that the action can hurt the linkers’ arms or body or knock these individuals to the ground. Part of the fun was seeing how many 3rd graders it took to block an 8th grader from breaking through. Call it early experiments in mass and momentum. You’ll feel better. I played Red Rover as a kid (ah, memories) and this is the first time it occurred to me that some people might be concerned about potentially getting hurt. Kids fall down all the time. Falling or being knocked down (without malice) does not equal getting hurt! It’s fun! So is rolling in the dirt with another silly kid. My 7yo daughters have always loved this kind of play. Disclaimer: I, age 47, do NOT find it fun to fall down. I might break. But we’re talking about kids here. Papilio, thanks for the link. I copied it at that other forum, so let’s see if anyone bites…. @lollipoplover: Thank Lenore, she shared it a while back, and maybe thank my good memory… I was actually looking for that report on child safety in first world countries, but couldn’t find it, and then I remembered some details about the article in which that report was referred to, googled that, and this was the first hit – hurray! Allowing children to constantly graze and snack sounds like a idiotic habit to me. Whatever happened to ‘no you can’t have chips now, we have dinner in half an hour’? Kids meals – I don’t know. Most people have some ingredients they just don’t like, and if small modifications help (such as avoiding bitter foods, or cutting the paprika in smaller bits so the taste won’t dominate, or less spicy), then I think adjusting meals for the children isn’t so bad. Or is a kids meal basically junkfood? That is a different story, of course! Off-topic, but: 1881: Neurologist George M. Beard charges that both NEWSPAPERS and the TELEGRAPH create “nervous disorders” by exposing people to “the sorrows of individuals everywhere”. Now THAT was an excellent prediction! Makes me want to walk into the nearest elementary school and ask the principal to please get on his/her computer and read the article in my presence, and then tell me if he/she is willing to check into making this change at his/her school. Unfortunately… this great study represents change. Most people, especially educators, don’t like change. 1) Would mean having to explain to everyone why they are changing – and that’s a big deal! 3.) Would mean explaining to counselors why their anti-bullying programs and classes are no longer needed. 4.) Would mean trying to figure out how they can keep the money allocated for playground maintenance and new playground equipment. Schools hate to NOT SPEED MONEY. That’s the main reason they exist. I’ll bet some of you can name other reasons schools will not embrace this great breakthough. I also can’t imagine many schools being willing to suspend any rules. Schools are not necessarily opposed to change, and no, they don’t exist just to spend money. Part of the issue is that there are plenty of parents who threaten to sue the school if their child falls down or gets hurt at school. Schools walk a fine line between letting kids play like they should and preventing injuries so they don’t have to deal with unreasonable and expensive lawsuits. Schools aren’t opposed to change that gives them more power. 2/ A bill bringing in universal public healthcare (I thought Obamacare was this, but it seems not, maybe). Then no one would care overly if their kid fell off whatever and injured themselves learning their limits. We do not have to worry overly about accidents in NZ because, along I believe with some other Western countries and as mentioned before on this site, we are generally not allowed to sue people/schools, and our imperfect but still pretty good healthcare system is free in the case of accident (and often close to free for other stuff). That doesn’t mean you can’t be charged for negligence if you have been particularly stupid and caused injury to someone, but it does mean every Joe Bloggs can’t go after you for minor matters. @Hineata–I’m not sure if it’s necessarily the cost of healthcare that’s entirely responsible for the death of playgrounds, because I’m from Canada, and I’ve seen playgrounds being dumbed down, and ripped out altogether (like the preschool playground in the YMCA child care), in the name of “safety.” So, now the YMCA playground consists of a small, paved, fenced area that’s mostly taken up by a sand pit, where the playground equipment used to be. Yes, there are other issues at play in a lawsuit–quality of life, pain, suffering, and mental anguish, loss of care, guidance, and companionship (for a child, it’d be mostly “companionship”), but still, the chances of a child being catastrophically injured by falling a few feet into sand, are pretty slim. Since that playground just consisted of a wooden climbing structure with a plastic tunnel and slide, the only way a child could really be hurt is if they were climbing on top of the tunnel, and since most of the occupants of that playground were three and four years old, I never once saw any of them doing that. I suppose it could happen, but they were always supervised by an adult, who probably would have either stopped that practice, or stood next to the tunnel to catch the child if necessary. Anyway, my point is, ripping out the YMCA playground seemed like a pretty knee-jerk decision, with a side of CYA–like when they made us all take a child protection course last winter, after years of just trusting us. I did it, so as not to make waves, but it seemed pretty silly, considering I’d started volunteering there when I was twelve, and I’ve been a part of that YMCA in one way or another since I was a baby. It’s kind of a shame, because the YMCA has better things to do with its limited resources than to organize unnecessary courses for people who are known to be safe, and to tear down play equipment that children enjoy. The diving board in the pool doesn’t meet the current regulations (not enough depth underneath), but it’s been grandfathered in, so we’re all just hoping that it doesn’t break. That diving board has been there for as long as I can remember, and it’s seen a lot more enjoyment than injuries, so, it’d be a shame not to have it. First, this is not really about lawsuits. The frivolous lawsuit problem is as much a myth as the kidnapper lurking on every corner. Yes, it happens but schools are absolutely not getting sued left and right and people are not threatening lawsuits left and right. But Americans are MAJOR WHINERS. When my daughter was in daycare the administration sat at the counter at the entrance. Almost every day there was someone (one of a handful of parents) who whined about some normal childhood injury or slight on their child. As someone who has people whine at me constantly about stupid crap, it gets very old very quickly. You either do something to stop the whining or get rid of the person. Public schools can’t get rid of the people. I can easily see schools changing rules just to stop all the infernal whining so that they can actually do their jobs. But more importantly, there seems to be this idea on this blog that helicopter parenting is fringe parenting. However, in my experience overprotective, if not helicopter, parents FAR FAR FAR FAR outweigh the free range parents today. FAR FAR FAR more people want to get rid of tree climbing and Red Rover than want to keep them in. Schools reflect their constituency and, until society moves away from this overprotective attitude towards kids, schools are going to reflect it because that is what the majority of the parents want. As for universal health care, while I agree that we need it, that isn’t problem here. Helicopter parenting is a middle and upper class disease. You do not see it in the poorer populations. The middle and upper classes are all well insured. I think it is worst-first thinking mixed with busy lives. The parents of my daughter’s friends constantly jump to serious head injury every time their children climb something. The thought that a more likely injury, if any occurs at all, from their child falling is a broken arm or broken leg never enters their mind. It is always serious head injury. And, most kids are raised in two working parent households today. Even the parents who pick their kids up right after school at my daughter’s school are largely workers who either work part time or run a business or work off hours or go to school. Very few are true stay at home parents with no regular commitments outside the home. And we’re isolated. Few people live near grandma who can take the broken child while mom goes to work so mom is stuck taking time off work that she may not be able to afford. I know that I would be totally screwed if my daughter broke her leg and couldn’t go to school or camp on a week that I had trial. First, this is not really about lawsuits. The “frivolous lawsuit problem” is as much a myth as the kidnapper lurking on every corner. Yes, it happens but schools are absolutely not getting sued left and right and people are not threatening lawsuits left and right. But Americans are MAJOR WHINERS. When my daughter was in daycare the administration sat at the counter at the entrance. Almost every day there was someone (one of a handful of parents) who whined about some normal childhood injury or slight on their child. As someone who has adults whine at me constantly about stupid crap, it gets very old very quickly. I can easily see schools changing rules just to stop all the infernal whining so that they can actually do their jobs. But more importantly, there seems to be this idea on this blog that helicopter parenting is fringe parenting. However, in my experience overprotective, if not helicopter, parents FAR FAR FAR FAR outweigh the free range parents today. FAR FAR FAR FAR more people want to get rid of tree climbing and Red Rover than want to keep them in. Schools reflect their constituency and, until society moves away from this overprotective attitude towards kids, schools are going to reflect it because that is what the majority of the parents want. As for universal health care, while I agree that we need it, that isn’t problem here. Helicopter parenting is a middle and upper class disease. You don’t see it in the poorer populations. The middle and upper classes are all well insured. And, most kids are raised in two working parent households or single parent households today. Even the parents who pick their kids up right after school at my daughter’s school are largely people who work from home or work part time or work off hours or go to school. Very few are true stay at home parents with no regular commitments outside the home. And we’re isolated. Few people live near grandma who can take the broken leg child while mom goes to work so mom is stuck taking time off work. I know that I would be totally screwed if my daughter broke her leg and couldn’t go to school or camp on a week that I had trial. As far as Americans’ fear of childhood injury, I really don’t understand it either. I mean, nobody wants to see a child hurting, but it’s part of life. Kind of like teething. One of my daughters used to faceplant multiple times per day, for months, shortly after she started walking. It sucked royally, but one would think she’d eventually learn how to walk or fall more sensibly! I wasn’t about to put her in a wheelchair! I do think that if you let your kid get hurt when you “could” have prevented it, others judge you. I’ve had even good friends tell me off for not making a bigger fuss about minor childhood injuries and illnesses. Where do people get the idea that all childhood injuries can and should be prevented? I try to deflect the judgment by asking my friends whether they ever fell or bumped themselves as a child. Often the response is, “yes, and my parents should have been more careful” or “yes, but they didn’t have modern technology then.” Blah. Exercise for the brain without a textbook or computer, imagine that. Awesome! I hope more and more schools, and communities worldwide start following suit. We all used to this when we were kids, as did our parents, and their parents before them. In a world of trends, this is a trend I can truly support. Getting of the districts could also be an opportunity to get the quality of those schools on a more equal level, by spreading out the money more evenly (instead of rich neighborhood means good education, poor neighborhood means bad education). Falling doesn’t necessarily mean hurting, not for a child. I used to get bruises and scrapes and my mother would ask where I got them. I said I didn’t know, which was true (she had trouble believing it). They just happened in the course of the day, climbing things, running around, etc. And falling down and bouncing up. @Papilio–The “this is our playground, the kids like it, and sometimes, someone gets hurt, but we patch them up and life moves on” approach is pretty much what my friend and I did with the music camp–she wrote a disclaimer that was basically, “Our music camp includes hands-on, physical activities as part of the educational content, and we also take the kids to the park at lunch time. Being active is a part of childhood, and getting hurt is sometimes a natural by-product of being active. If your child needs first aid, or medical attention, or even the hospital, we’ll make that happen, and keep you in the loop, but we can’t guarantee that your child will never get hurt.” As a result, we only had two “incidents” of note–one child throwing up after spinning too much on the tire swing (moments before the recital, and she still performed), one child cutting her foot on a stick on the playground (because she wasn’t wearing shoes). We had a few kids cry for emotional reasons, like “they wouldn’t play with me,” or “I wanted the red boomwhacker and I got the blue one,” or similar, and we had one get a headache before the recital (she still did it too), but that was pretty much it. Things were like that during my youth as well–it was often “swim/skate/ski/ride/bowl/swing/slide/climb/play at your own risk,” but nowadays it seems like the knee-jerk response is just to eliminate the risk. Also, I just watched the video, and the part that stood out to me was, “If kids want to read a book at recess, that’s fantastic too. The library’s always open.” In my mind, that’s a truly free-range recess–kids are free to climb, swing, throw, catch, kick, tackle, cartwheel, or read a book. When I was a kid, the times when I was happiest at recess were the times when I was allowed to go to the library or the computer room (or the music room at lunch time when I was in high school), because that made me feel like the school understood what I wanted to do at recess, and felt that reading, playing a computer game, practicing a musical instrument, was a legitimate choice of free-time activity. I was just as miserable when forced onto a crowded, noisy playground, as the more athletic kids probably are when they’re given asinine rules like “no balls,” or “no running,” or “no cartwheels.” But, my point is, kids respond well when they feel like they’re being heard, and when they feel like the adults trust them. So, in that case, it doesn’t much matter whether that child is being trusted to play tackle football safely, or behave appropriately while reading quietly in the library during recess–the point is, a little bit of “yes” can go a long way. @Emily – But I think a major part of many of these asinine rules is this everyone-should-be-able-to-get-whatever-they-want at-school mentality. And that is what a lot of this boils down to. Too many people trying to get schools containing 500 students to cater to their own particular wants. Back when I was in school no parent would have ever even considered for a millisecond going into school and complaining that Johnny is special and needs to be able to stay inside while everyone else goes outside. The class went outside; you went outside. The class went to the library; you went to the library. The class studied X; you studied X. 100% end of the story. There wasn’t all this catering to the individual wants of specific children. Schools can’t possibly please 500 different children all the time, and the more they are pushed to comply with whims of each student, the more they are going to have stupid rules because it is easier to just say “it’s a rule” than to spend every single day arguing with one side of the coin or the other. My daughter’s middle school is getting more free range about lunch. At first everyone in sixth grade (all three hundred kids) had to stay in the cafeteria. Now they can stay in the cafeteria, go outside after eating, go visit a teacher for homework or reteaching, or go to the library to use the computers or read. The kids make the decisions but all the kids are careful not to lose their privileges. The kids don’t want to be the one who forces all three hundred kids back in the cafeteria. Most teachers, if you bring your lunch, will let you eat in their classrooms. For the library you have to eat first then visit the library. I do think that more choices can and should become viable options as children get older. But largely these articles are talking about ELEMENTARY school, not middle and high schools. 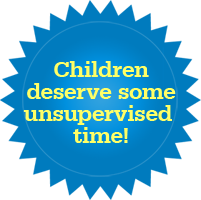 Not all elementary schools can supervise kids in many different activities at once. Expecting a 12 year old to be able to sit quietly reading a book in the library while a class is going on is reasonable; expecting a 5 year old to do the same is not. Allowing 12-18 year olds to decide where to eat lunch is reasonable; giving 4-8 year olds the same power is probably not unless you have someone to supervise all areas. Age is very relevant here. @Donna–I think we’ve had this conversation before. Of course the “library open at recess” thing wouldn’t work if it was a multi-track school, but when I was in elementary school, everyone was on the same schedule, so everyone went to recess at the same time, and so, it was feasible–the library and computer room only closed at recess, because none of the teachers wanted to supervise anymore. It’d be more complicated at a multi-track school, but if it’s single-track, it’s possible. Traditional, outdoor, “run around and scream” recess was never really a break for me, because I needed a break from interaction, and a break from constant sensory input. I got SO much flak over this, for being “antisocial,” and “thinking I was special,” but really, I just needed a break, because a six-hour school day is a really long time to have to be “on.” I also got bullied, but the “introvert” issue was probably as a big a problem as the “bullying” issue. Anyway, the school in this story is recognizing that some kids are introverted, and would prefer to spend recess in the library as opposed to on the playground, and I think that that’s a great thing.